It’s part explainer, part science lesson and part holiday greeting. 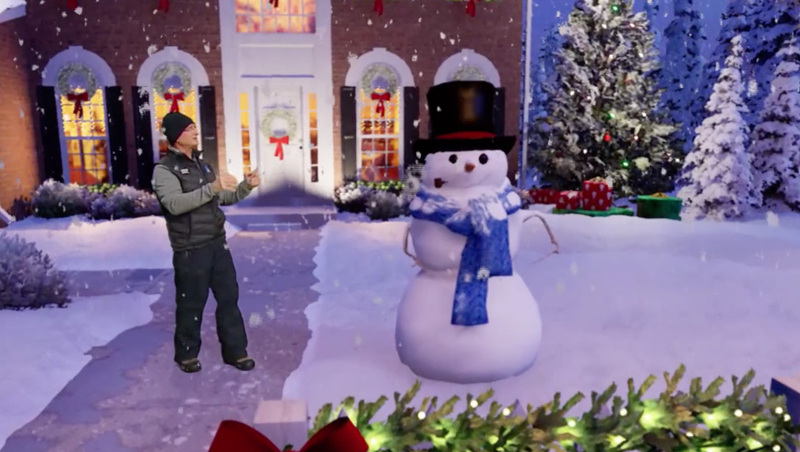 Winter weather expert Tom Niziol, shown bundled up in front of a virtual house decked out for the holidays first explains the deal temperature for the perfect snowball — as opposed to snow better suited for skiing. As he’s speaking an animated ball of snow “rolls” next to him, giving him the opportunity to explain the weight of wet snow. Two other balls helpfully roll in while Niziol explains the perfect ratio of each part of a snowman’s body and head. Then, of course, comes the lumps of coals for eyes, sticks for arms, carrot nose and corncob pipe. But don’t forget the “magic” hat — which flies into the scene and makes the snowman “come to live” to join Niziol in wishing viewers happy holidays. So far, The Weather Channel has used IMR to simulate a tornado, summer safety tips, flooding, wildfires and the science of how weather affects football.